Askar Refugee Camp - Where is Askar Camp Located? Refugees in Askar came from 36 villages in the Lydd, Haifa and Jaffa areas. Like other West Bank camps, Askar was established on land UNRWA leased from the government of Jordan. 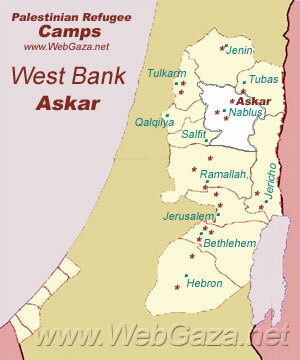 Where is Askar Camp Located? Askar camp was established in 1950 on 0.12 square kilometres, it is located within the municipal boundaries of Nablus. In 1965, severe overcrowding led camp residents to expand to an extra 0.1 square kilometres of adjacent land. Camp residents refer to this new area as "New Askar". "New Askar" is not, however, officially recognised as a camp, and there are thus no UNRWA installations in the new camp. Division of power between the Palestinian Authority (PA) and the government of Israel has further divided the original and “new” camps; the original camp falls within “area A,” and is thus under PA control, whereas the “new” camp is in “area B,” and is thus under joint PA-Israeli control. Overcrowding persists in the camp. The camp committee has suggested expanding the camp's boundaries as a possible solution. Since these camps fall under the jurisdiction of host governments, however, UNRWA has no authority to undertake camp expansions. All shelters are connected to public water and electricity infrastructure. The unemployment rate is 28 per cent.